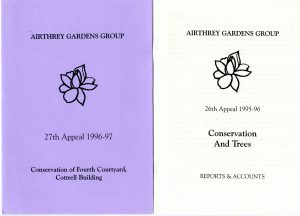 The Airthrey Garden Group was formed in June 1970 to “maintain the beauty of the former Airthrey Estate”. 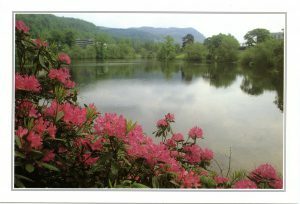 A recognition that from the outset the University of Stirling endeavoured to foster links with the local community and understood that the beautiful campus was central to the success of the University. The Group had members from the local community and university staff. The Airthrey Gardens Group raised money to assist with planting , landscaping and promotion of the entire estate. Their appeals included, planting of flowers in the residences, the Henry Milne Walk, (in memory of the first Superintendent of grounds), garden seating and conservation of the Pathfoot courtyards. Postcard of the campus produced by Airthrey Gardens Group. The Group produced a range of guides and organised walks and talks to promote the campus and gardens. They organised events for staff and visitors to the campus and ran successful fund raising appeals to support the maintenance and development of the campus. 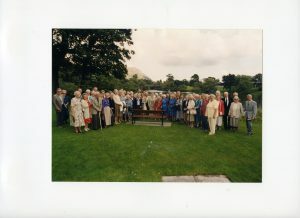 At the last meeting of the Group in August 2000, six benches with plaques “Gifted by the Airthrey Gardens Group 1970 – 2000″ were presented to the University. A fitting tribute to 30 years of dedication and enthusiasm which helped preserve the beauty of the campus for all to enjoy.